I’m having a hard time with forgiveness and I can’t stop thinking on why I just can’t let go. I’m holding it in my mind and gut. I’m becoming my own worst enemy, a little girl standing firmly with her hands balled into fists at her sides, yelling at the world. It’s like I’m ready for a fight every day. This is not me. I can assure you. I fear I may have ruined a beautiful and loving relationship. I push his love away at every turn and sometimes cruelly. But I do love him and miss him. But I can’t keep be with him right now. I’m not in the right frame of mind or heart. I’d really like to fix that. So here I am writing to ask for help. Ah forgiveness- that is a tricky process isn’t it? So often we think forgiveness is a matter for our minds and not our hearts. Or we feel we ought to forgive but we just can’t. We get caught up in our minds, replay events over and over, and it doesn’t seem to get us anywhere other than exhausted. Let’s try another way, one that doesn’t require you to think but to trust in your Higher Self and work with a beautiful image– that of the Three Fold Flame. I feel this will be a good way for you to dissolve those harsh energies in your gut (your solar plexus) and also let go of the desire to ‘be right’ (in your mind), uncurl your fists and slowly come into balance. Can you see that if you’ve been thinking a lot about how to forgive, you’ve been working with your Soul’s desire of “I want to forgive.” You can assist your Soul by releasing your will and aligning with the Will of God. That is what the blue plume of the flame is about: alignment of power. What better way for the Soul to achieve that goal than by yielding, by surrendering the thought, the energy of, “I’m right and you are wrong”. The yellow plume involves the right use of knowledge and discrimination- it’s about wisdom. It holds within it a love of learning and a desire to share that wisdom. As you focus on this plume you might find insights into what triggers your resistance to forgive, to fuel your need to fight, or to hold others at a distance. 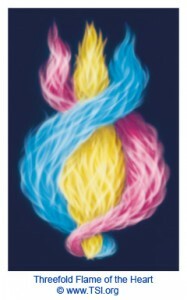 The pink plume represents love and compassion. This is a love that does not seek to smother or control: it is a love that is supportive and freeing. As you focus on this plume, simply allow love to flow unconditionally; trust you are loved by Source just as you are. If you allow yourself to receive this love you’ll be able to love others in that way too: not judging them, but simply loving all of them. But this only comes after you’ve been able to love yourself completely, warts and all: to love what you want to obliterate or ignore in yourself. Once you start loving all of you, you’ll find you can accept others for where they are and forgiveness will come. You’ll know this because the plumes of the flame will come into balance. For when the plumes within the Flame are balanced, our power is tempered with love and this love is saturated with wisdom. So for now, just sit comfortably and breathe into the chakra above your heart and below your throat. Sit and visualize the Three-fold flame and notice what comes up- don’t think just feel. Are you drawn to a particular color? If yes, let yourself be consumed by this plume. Is there a plume that is larger than the others? Watch this and just rest within that plume. Over time, do the colors come into balance? If so see how that feels. Trust this exercise to tell you, through the plumes, what is going on within your Soul. Sit quietly and focus on the color of the plume and allow yourself time to meditate and notice what emotions come forward. Try this for a week and let me know how it goes. Join our mailing list to receive the latest news and updates from Healing Channels. By visiting this website, scheduling a consultation or appointment, and or booking a session with Healing Channels /Rosa Haritos PhD, you understand and agree that Rosa Haritos PhD is a medical sociologist, healing medium, shamanic practitioner, but not a physician, psychotherapist, or other licensed professional. Her advice, healing sessions, workshops, are offered to supplement Western and Traditional medical protocols. Please consult your physician or other licensed health care professional for any physical or psychological conditions you may be experiencing.